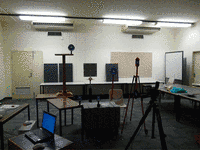 KIT-GIK-Studium und Lehre - Studien- und Abschlussarbeiten - Diplomarbeiten - Extensive metric performance evaluation of a 3D real-time range camera. 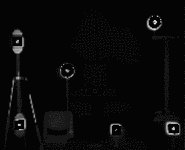 Extensive metric performance evaluation of a 3D real-time range camera. Three dimensional (3D) range cameras measure 3D point clouds and intensity information of objects using time-of-flight methods with a CMOS/CCD array. Their emerging applications are security, surveillance, bio-mechanics and so on. Since they comprise an array of small detectors, a nearest-neighbor search for individual points is not necessary for the case of single instrument, which can increase the efficiency in estimating the geometric properties of objects. This fact leads us to broaden the application areas of 3D range cameras to real-time and dynamic applications such as mobile mapping and vehicle navigation. It is a new and largely untested technology showing potential in industrial applications. In general, a laser scanner would be used to obtain 3D coordinates of an object, which may be unsuitable in conditions having spatial and temporal limitations and financial constraints. Therefore, a range camera may provide a more suitable alternative, taking for example the automotive industry where 3D range cameras’ size allows it to be mounted in the interior of the car to observe passenger position as part of the airbag sensing systems (Oggier et al., 2005). In order to ensure a good metric performance in these applications, it is necessary to evaluate the camera to highlight the areas of promise and areas that need further development, such as calibration and error modeling. Errors need to be identified by first conducting experiments to analyze basic elements of the camera used in those industries, beginning here with its precision and accuracy. 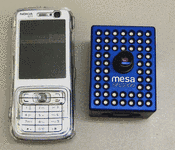 This diploma thesis provides a general overview of this new instrument and extensive metric performance tests of a 3D range camera, SwissRanger SR-3000 (Mesa Imaging, 2008). Images from current cameras display only two dimensions (2D), lying in the x and y coordinate space. In order to obtain three-dimensional (3D) information, photogrammetry techniques using two images of the same place from differing perspectives will allow 3D coordinates to be computed. Figure 1: Phase shift distance measurement principle for 3D range cameras where c(τi) is the detected intensity of the returned signal at time τi and Δτ is the temporal sampling interval of a 3D range camera. 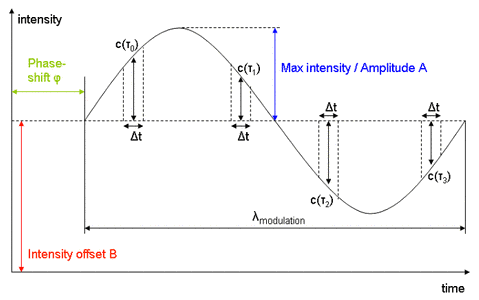 where λmod is the modulation wavelength. This technology allows 3D data to be captured simultaneously, as well as removing the requirement to capture two images for processing. Therefore, it reduces the necessity to have multiple setups and perhaps increases the efficiency for post processing of the images. The Swissranger SR-3000 camera is composed of a 176x144 pixel CMOS array for which the pixel size and spacing are both 40µm. The nominal principal distance of the lens is 8mm. Several rangefinder system parameters such as the integration time (max. 51.2ms) and the modulation frequency can be set by the user. For example, the shorter integration time is maximizing the signal-to-noise ratio. In addition, the maximum unambiguous range is 7.5m with the modulation frequency of 20MHz (Mesa Imaging, 2008). LEDs (Light Emitting Diode) are favored over conventional lasers since they can produce a continuous wave with a high modulation frequency and a low price. SwissRanger SR-3000 has 55 LEDs with a modulation frequency of 20MHz and a wavelength of 870nm. The field of view is about 47.5° x 39.6° and the special resolution about 1cm in a distance of 1m. In front of the sensor, an optical band-pass filter is placed in order to reduce the impact of background illumination (Oggier et al., 2003). More details on the hardware aspects of SwissRanger SR-3000 can be found in Lange et al (2000) and Oggier et al. (2003). I conducted in the preliminary experiments several precision tests with various hardware setup such as warm-up time, integration time and amplitude threshold. As an example, the intensity and range images from SwissRanger SR-3000 are presented in Figure 3 with the distance threshold (minimum distance = 1.80m and maximum distance = 2.20m). 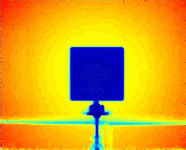 The warm up test provided the information that the camera derives accurate measurements after about six minutes of running. This can be explained due to the internal heating of the range camera as well as the highly temperature dependency of the CCD sensor. Furthermore, the repeat accuracy was investigated, because of finding a reliable amount of measurements for averaging. It could be shown that with increasing the distance to the target, the repeat accuracy decreases, as expected. In addition, the standard deviation could not be significantly improved after 20 measurements. However, due to the excessive performance evaluation a total amount of 30 measurements has been made. Probably the most important key parameter of the SwissRanger SR3000 is the integration time. This value controls the exposure time of each image and can be changed from 0.2ms up to 51.2ms in 0.2ms intervals. This means that with increasing the integration time more emitted light can impinge on the sensor and a more accurate distance measurement can be assumed. However, more erroneous measurements can occur due to too much background illumination. With two different targets (grey matte metal board and white paper target), the optimal integration time for several distances was investigated. It could be shown, that the setting of the integration time depends not only on the distance to the target, but also on the target itself, respectively the reflectivity characteristics. Although, using a white paper target increases the performance of the range camera at larger distances, the measurements within short distances (up to 1.00m) were strongly influenced by over saturation of the sensor, if choosing too high integration times. This can be explained by the high reflectivity characteristic of white paper. In general, using high reflectivity colors at close distances to the SwissRanger SR3000, the error that can be made with choosing the wrong integration time can be significant. In contrast, using bad reflectivity colors (e.g. black) at close distances, the error by choosing a wrong integration time is not so high, because the sensor will not suffer over saturation so fast. However, with increasing the distance, the problem of over saturation decreases and the performance towards better reflectivity colors increases. Using different targets with different colors provided different results of measurements. The next approach of testing different reflectivity characteristics was applied to the surface of the target (e.g. matte, gloss, etc.). The both matte targets used for the integration time tests provided accurate results. Therefore, two glossy targets were used, i.e. a mirror and a grey glossy metal target. In both measurements, the middle of the sensor was highly affected by over saturation and caused erroneous data. Note that the mirror caused many errors in the data sets and is not a good target as assumed, due to the very good reflectivity characteristics. Another impact on the measurement with the SwissRanger SR3000 is the effect of scattering light. 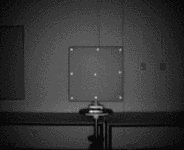 This occurs due to other different objects within the illuminated scenery (Figure 4). In three different approaches could be shown, that this effect is on the one hand depended on the objects near to the actual target and on the other hand the reflectivity characteristics of the objects. For example, a distance towards a detached target was calculated to 4.576m. After measuring within a complexity environment, consists of several high reflectivity objects, the distance of the target changed to 2.343m. In addition, not only the distance measurement was influenced but also the X- and Y-coordinates, next to a close object. The last approach was trying to find out the absolute accuracy of the SwissRanger SR3000, with the help of a more accurate instrument, i.e. a Leica ScanStation. Due to the lack of knowledge about the origin of the SwissRanger SR3000, a possibility of getting the absolute accuracy information without knowing the origin was searched. With the help of a 3D similarity transformation and several identical points (on the target and off the target), the SwissRanger coordinate system could be transformed into the Leica coordinate system in order to compare both measurements. However, using identical points on the target could not achieve the information about the absolute accuracy, it could be shown, that with the help of identical points, the measured point cloud can easily be transformed into a more accurate coordinate system, i.e. a possible offset can be eliminated. Additional identical points (reflectors) could derive accurate estimated parameters and therefore an estimated absolute accuracy of about 1cm at distances of 1.50m and 2.00m, about 3 cm at the distance of 4.50m and a decreasing absolute accuracy up to 16 cm at the distance of 5.50m. To summarize the results of this thesis is has been shown that the measurements of the SwissRanger SR3000 are highly influenced by not only the environment, but also by the reflectivity characteristics of the target. The test, which were achieved during this thesis where all static tests, but the main feature of the camera is the potentiality of continuous measuring, which enables the opportunity of using the camera for tracking objects, gaming, quality assessment, etc. Although it takes some time after becoming acquainted with the SwissRanger SR3000, the range camera is a very cost effective and accurate solution in order to obtain 3-dimensional information of the environment. Büttgen, B., T. Oggier, M. Lehmann, R. Kaufmann, and F.Lustenberger, 2005. CCD/CMOS Lock-In Pixel for Range Imaging: Challenges, Limitations and State-of-the-Art. In: Proceedings of 1st Range Imag. Res. Day, pp. 21-32. Oggier, T., B. Büttgen, F. Lustenberger, G. Becker, B. Rügg, and A. Hodac. 2005. SwissRanger SR3000 and First Experiences based on Miniaturized 3D-TOF Cameras, In: Proceedings of 1st Range Imag. Res. Day, pp. 97-108. Gordon, S. J., 2005. Structural deformation measurement using terrestrial laser scanners, PhD thesis, Department of Spatial Sciences, Curtin University of Technology, 229 pages. Oggier, T., M. Lehmann, R. Kaufmann, M. Schweizer, M. Richter, P. Metzler, G. Lang, F. Lustenberger and N. Blanc. 2003. An all-solid-state optical range camera for 3D realtime imaging with sub-centremeter depth resolution (SwissRanger), In: Proceedings of SPIE, vol. 5249, pp. 534-545.